The weekly American Association of Individual Investors (AAII) stock sentiment survey shows a surprising increase in optimism. Of the respondents, 44% were bullish (a 5% increase from last week) and 35% were bearish (a 10% point drop from before). We aren’t near any sort of extreme level, however the direction of sentiment is puzzling since the stock market closed lower than it has for the past 18 days. The stock newsletter editors, as measured by ChartCraft’s Investors Intelligence, shows a similar increase in optimism. This week the II had 50.6% bulls (4% point increase from last week) and 23.6% bears (a 0.8% decrease). I’m not sure how helpful this is as the Investors Intelligence bull/bear ratio has been relentlessly hovering around 2:1 for the past few months. In contrast to both of the above sentiment surveys, the Hulbert Stock Newsletter Sentiment index which measures a sub-set of market timing newsletters is showing a decline in bullishness. The HSNSI was at 45.2% when we hit an intra-day high of 1080 on the S&P 500 index. 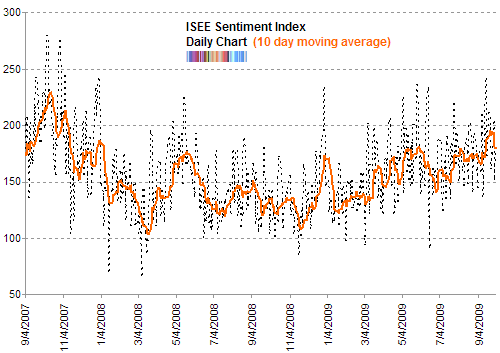 But now it stands at less than 29.1% a significant sentiment erosion in response to a small retreat in the index. A recent survey of institutional investors by TheMarkets shows that an increasing number of them believe we have seen a definitive low. While in June 40% thought so, now 70% do. Furthermore, 90% of them expect the S&P 500 to climb to the 1200 level by the end of the year in 2011. Back in March only 50% were as optimistic about the S&P 500 reaching that goal. An estimated $29 billion was withdrawn from equity mutual funds (domestic) by US retail investors for the month of September. Meanwhile, they dove head first into fixed income funds by buying almost $46 billion worth of taxable and municipal bonds last month. This is a continuation of the trend which I highlighted before: Equity Mutual Funds Show Outflow Even After 60% Stock Market Rallly. So if it isn’t Mom’n'Pop investors and it isn’t corporate insiders, who is buying? Leaving aside conspiracy theories of the Plunge Protection Team - because let’s face it, if they exist they are very bad at their job - we are left with opportunistic hedge funds. The usual suspects are either grey/black boxes or discretionary traders chasing a momentum market higher. Remove this remaining leg and the table get mighty wobbly. Zooming in on the week’s data, the ISE sentiment index hit a high of 204 on Tuesday but as the S&P 500 fell for the rest of the week, it actually registered a slightly more optimistic tone. I was watching to see if we would make it down to 100. But this small decline was not enough to rattle anyone in the ISE. 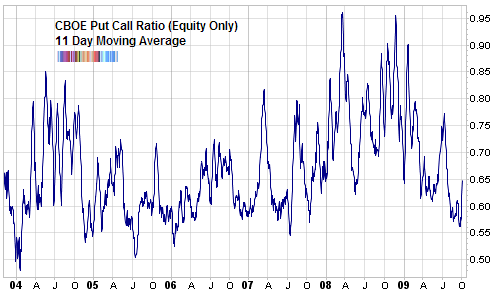 In contrast to the stubborn complacency shown in the ISE option data, the CBOE (equity only) put call ratio jumped to 0.84 on Friday - getting really close to the noteworthy 1 level. As well, the ratio increased every single day of the week, even on Monday when the S&P 500 closed higher. Checking in this week with a market guru who both literally and figuratively has earned the title of a ‘Grey Beard’. Steve Leuthold, the 71 year old money manager who is not afraid of going short, is very bullish right now. Leuthold expects the S&P 500 to end the year at 1200 and even higher at 1350 next year. In keeping with that bullish view, he has 72 percent of his fund invested in equities. Meanwhile, Doug Kass and David Rosenberg as well as Bob Janjuah of RBS - all of whom I’ve mentioned before - remain decidedly bearish and unmoved. Babak, thank you very much. I’ve never see an explanation for why “they” weren’t able to prevent (all) slides, but then again Santa gets to all rooftops. Btw, especially thanks for Leuthold’s comments. He’s not a perma-anything. Therefore, he has some credibility. I call it the mkt has been “throwing the ball at the spot where they have been swinging” as opposed to they have been swinging at where the ball has been thrown. Proof of that is when the trend changes direction they’re still swinging at the same spot, but the mkt isn’t throwing the ball THERE anymore. So it wasn’t skill it was luck, or rather the broken clock syndrome.